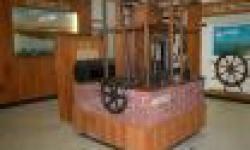 The John Gorrie Museum State Park in Apalachicola, Florida, USA offers a Museum where visitors can learn about the contributions of Dr. John Gorrie to the town and the amazing ice making machine he created. There are interpretive exhibits chronicling the colourful history of Apalachicola, and accessible amenities, geocaches are also hidden in the park, and there are sidewalks to the Gorrie gravesite and memorial. The John Gorrie Museum State Park is perfect for visiting and learning, then enjoying a picnic under the cedar trees, come see how one man changed the world, it's a fascinating experience.